Our cruising plans do not include transiting the Panama Canal. It’s a substantial cost, and I have no interest in crossing the Pacific (after our passage to Puerto Rico, neither does Scott). However, being one of the seven modern wonders of the world, and Panama’s biggest tourist attraction, we were very interested to see the canal. Since our route from Bocas del Toro to the San Blas islands took us within a few hours of the canal’s visitor center, it seemed a shame not to visit. The idea of creating a water passage across the isthmus of Panama to connect the Atlantic and Pacific Oceans dates back to the 1500s, when Spain surveyed a possible route across Panama’s Chagres River. The idea seemed impossible at the time, but remained intriguing a potential shortcut from Europe to Eastern Asia. France was first to attempt the daunting task. They planned a sea-level canal, with Count Ferdinand de Lessep (builder of the Suez Canal in Egypt) in charge of the project. After breaking ground in 1880, the construction team soon realized the monumental challenge ahead of them. They were plagued by yellow fever and malaria, and incessant rains caused heavy landslides. De Leeps realized that a sea-level canal was too difficult, and shifted his plan to a lock canal. However, it was too late; funding was pulled from the project in 1888, after nine years and a loss of approximately 20,000 lives. With a push from President Theodore Roosevelt, the U.S. purchased the French assets in the canal zone for $40 million in 1902. After a proposed treaty over rights to build in Panama was rejected (at the time, it was a Colombian controlled territory), the U.S. threw its military weight behind Panama’s fight for independence from Colombia. In November of 1903, the U.S. negotiated a deal with the newly declared Republic of Panama, that gave them rights to the canal zone. In exchange for the ten mile stretch of land, the U.S made a one-time, $10 million dollar payment, annual payments of $250,000 and agreed to guarantee the independence of Panama. The U.S. also had plans for a sea-level canal, but much of the French equipment was in need of repair, and the threat of malaria and yellow fever was frightening off the workforce. A railroad specialist took over on July of 1905, and immediately recruited West Indian laborers to solve the workforce issues. He ordered new equipment, and came up with more efficient ways to speed up the work. In addition, he realized the difficulties that landslides posed, and convinced President Roosevelt that a lock canal would be best for the area’s terrain. What helped the project immensely was the chief sanitary officer’s belief that mosquitoes carried the deadly diseases plaguing the area (who knew they had a chief sanitary officer??). On a mission to wipe out the pesky mosquitoes, his team diligently fumigated homes, and cleansed pools of water. The last reported case of yellow fever in Panama was in 1905, and malaria cases dropped sharply over the following decade. In 1906, a new chief engineer took over, and he focused efforts on the Culebra Cut, a nine mile stretch of mountain range along the canal route. Clearing this area became a 24-7 operation, with more than 6,000 men contributing at any one time. Despite the attention paid to this section of the project, the Culebra Cut was a notorious danger zone. There were many, many casualties from unpredictable landslides and dynamite explosions (Good grief, its a wonder this thing ever got built!). 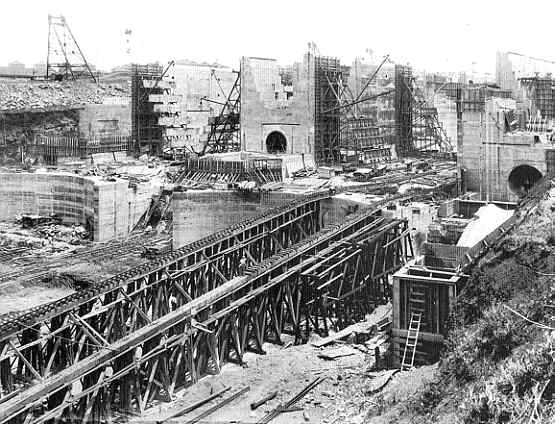 Construction of the locks began in August 1909. Built in pairs, each lock chamber leveraged gravity to raise and lower water levels (there were/are no pumps used). Ultimately, the three locks along the canal route lifted ships 85 feet above sea level, to the man-made Gatun lock in the middle. The entire operation was powered by electricity, and run through a control board. The gates separating the chambers in each set of locks hold back a considerable weight of water, and had to be made both reliable and strong enough to withstand accidents, as their failure could unleash a catastrophic flood of water downstream (bad for business) . Ranging in size from 47 to 82 ft high, depending on position,the gates are enormous, and are 7 ft thick; the hinges alone each weigh almost 17 tons! They can be opened during the operating cycle only when the water level on both sides is equal. The original gates are still in use, but their mechanisms were replaced with hydraulic struts in January 1998, after 84 years of service. Much like the hull of a ship, the lock gates are hollow and buoyant. They are so well balanced that two 25 hp motors are enough to move each leaf. If one motor fails, the other can still operate the gate at reduced speed. In October of 1913, President Roosevelt operated a telegraph at the White House that triggered an explosion of Gamboa dike, flooding the final stretch of dry passageway at Culebra Cut. The Panama Canal officially opened on August 15, 1914, but a grand ceremony was downgraded, due to the start of WWI. The canal was completed at a cost of more than $350 million, and was the most expensive construction project in U.S. history at the time. The canal was a vital part of expanding global trade routes in the 20th century. Transition of overseeing the canal, from the U.S. to Panama, began in 1977, with a treaty signed by President Carter, and the Panama Canal Authority assumed full control on December 31, 1999. In September 2010, the canal hosted its 1 millionth passing ship, and in 2016 a massive canal expansion opened, doubling the waterway’s capacity. After our short stay in Portobelo, we headed to nearby Linton Bay, which is just over an hour car ride to the visitor’s center at the canal’s Mira Flores Locks. It was also a short ride to a grocery store for provisioning, and an easy jump off point to head for the San Blas. We decided to leave the boat at Linton Bay Marina. From there we could visit the canal, spend the night in Panama City and return the next morning, with Howard and Sea Life tucked into a slip for safe keeping. We arranged for a cab to take us from the marina to the Miraflores Locks, traveling winding, hilly roads along the way, and arrived at the visitor’s center an hour or so later. The ticket office was not yet open, but there were already many people waiting to get in. We took our place in line, just beating a huge tour bus full of people..whew! As ships approach from the Pacific side, two locks at the Mira Flores Locks raise them up into Mira Flores Lake. At the other end of the lake, a single lock at Pedro Miguel Lock raises them again, into Gatun Lake and then a triple set of locks at Gatun Locks lower the ships back down to sea level in the Caribbean sea. Though the channels in the locks seem large enough for ships to pass in both directions at the same time, the Culebra Cut makes this impossible. The area is far too narrow for the large ships to pass each other, so two “lanes” transit traffic from the Caribbean to the Pacific in the morning, and then the direction shifts, for those transiting from the Pacific to the Caribbean. We were watching ships pass from north to south. They had transited from the Caribbean, and entered the locks from the Mira Flores lake. There were no private/pleasure boats coming through when we visited, only large ships and smaller commercial vessels. Pleasure boats and small fishing boats usually transit very early in the morning, or after dark. They are tied together, or to a canal tug, as they move through. We have several friends who’ve transited the canal, and all have stories of things not going exactly as planned. Here are some photos. They also have great blogs! Mini towing locomotives, called mules, are used for side-to-side and braking control in the locks (Forward motion into and through the locks is actually provided by the ship’s engines). The mules run on “rack tracks,” to which they are geared, and their traction is electric, supplied through a third rail that is laid below surface level on the land side of the channels. Large ships have two mules on each side at the bow, and two each side at the stern—eight in total, allowing for precise control of the ship. Each mule has a powerful winch, operated by the driver; these are used to take two cables in and out as needed, in order to keep the ship centered in the lock while moving it from chamber to chamber. With the larger ships having very little clearance, the mule operators have to be pretty good at what they do! All ship captains are required to yield control to a canal pilot while transiting, who are specially trained to guide vessels of all sizes safely through the locks. Some ships are so wide that they clear the concrete walls by mere inches. A lock master is in position on either side of the lock, and is in constant communication with the pilots and the control tower during the entire process. An announcer narrates details about each ship passing through the two lanes, providing the country of origin, what type of cargo is on board and other details. Relayed in both Spanish and English, the information was both interesting and helpful as we watched the huge ships pass by us. We saw some amusing sights as the ships passed by: a basketball court on the deck of a ship, crew members enjoying the ride in a shady spot and the amount of radar waves that we were exposed to at the observation deck level! When the canal opened, a set of guidelines were put in place for the maximum requirements of ships transiting across. “Panamax” includes the width and length of the available lock chambers, the depth of water in the canal and the height of the bridges that span the it. A new set of locks opened in June of 2016, allowing larger, “New Panamax” ships to transit back and forth. From our spot on the viewing deck, we could see ships transiting those lanes as well. There was so much see; we stayed on the viewing deck for hours, taking it all in. When all the ships has locked through, we headed downstairs to check out the rest of the visitors center. There was a short film on the history of the canal, and many rooms of exhibits, containing information about the canal’s construction. We ended our visit with a spin through the gift shop, and then went outside to catch a cab to our hotel, stopping on the way at McDonald’s, for Scott to get a fast food fix! At the recommendation of one of our friends at Red Frog marina, in Bocas del Toro, I’d booked a room at the Comfort Inn and Suites, which sits right on the canal route. The balcony rooms look over the Balboa Yacht Club’s many boats at anchor, and ships on their way to and from the locks. Scott kept watch online, in live time, to see when a ship was coming our way. We’d take a break from the air conditioning, and watching English television channels, to go out and watch them pass by (our balcony was in full sun until dusk, so small bursts of outside time were all we could handle). Our water view all but disappeared during a late afternoon downpour, as the streets below quickly flooded. We ate a room service steak dinners on our king-size bed, enjoyed long, “roomy” showers, and kept a “ship watch” out the window until well after dark, and again at first light the next morning. It was a great Christmas treat to ourselves! Here are many more photos.